Paul Cortez’s recent letter to the editor of the Hispanic Vista is now featured on their site. Hispanic Vista is a magazine which dedicates itself to exploring political and social issues pertaining to the lives of American Hispanics. A tough-as-nails judge went too far when she ordered a confidential informant to be locked up three times longer than prosecutors had agreed upon in a deal with the woman. You can check in here for the latest news & updates regarding Paul’s fight for Appeals. Paul will be turning 30 years old on March 18th. 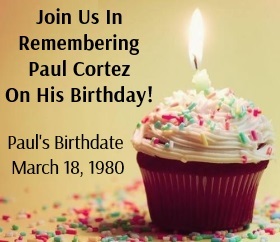 In order to celebrate his day and help ensure that he does not also spend his 31st birthday in prison, we are asking all of his friends, family members, and supporters to please acknowledge Paul’s day in a way that will seriously impact the rest of his life.